Too broke to travel the world, just the right amount of broke to travel to new cultural eateries in our area. Alas, we’re still waiting for the day our numbers are called out in the lotto draw (or the day we can retire at 30, whichever comes first), but until then, it’s nice to know that we can take a little culinary journey through Greece, Italy, Colombia and the Middle East in one chonky car trip. Jazz hands at the ready – Emporium Hotels’ Piano Bar has keyed into South Bank’s social scene. Besides an actual grand piano in the heart of the lounge bar, a curved gunmetal bar and custom-built chandelier, opulence overflows from every nook of the elegant newbie. Sit back and relax with an Old Fashioned, and be sure to try the Emporium signature zebra éclair with pineapple compote, liquorice curd, whipped pineapple posset and white chocolate. She’s open from 10am, seven days a week, for brunch, lunch and dinner, and late night snacks! Spero is the Greek boy your mother warned you about, and now the restaurant you won’t be able to resist (sorry mum). The team behind Rice Boi and Saltwater Fish & Chippery will be opening the 200-seater eatery on April 11, letting you get your fix of signature Greek-style lager, slow-cooked lamb shoulder with a pomegranate molasses glaze, and fried Mooloolaba prawns wrapped in kataifi pastry. Hello handsome. Burleigh Heads bambino Justin Lane is set to expand! The popular Italian restaurant and rooftop bar is rumoured to have new venues popping up on both the Sunshine Coast and just over the NSW border, with Justin Lane’s owners currently on the lookout for spaces to lease. Can’t be mad at the prospect of more pizza! Prepare to feast on all things Middle Eastern at newly opened Pilpel! The Redcliffe restaurant is open for lunch and dinner, serving everything from pots of chorizo and seafood to Israeli tea and dessert. Show me the mezzah! Gone are the days of spilling keep cup coffee all over your suit – coffee’s back in bar form! Coffee Fruit Bar is an environmentally friendly creation by the good team at Brisbane’s I am Grounded. Made from the fruit of coffee sourced from micro-lot farms in Colombia, each superfood bar contains 10 grams of natural, upcycled coffee fruit pulp, and other tasty (and organic!) ingredients such as lemon and coconut, and cocoa and nuts. She’s waste-free, super good for you, and available here. Rise and grind. Things are getting chooked at PappaRich, with the return of the ultimate fried chicken sandwich! Once only available to Sydney-siders, the mother of all sandwiches is gracing Brisbane with its succulence from March 25 for a limited time. In collaboration with Morgan McGlome of Belles Hot Chicken, the cheeky chicky sanga is loaded with Morgan’s signature fried chicken, Malaysian slaw drenched with coconut vinegar and Pappa’s secret sauce, layered between PappaRich’s soft and fluffy Hainan bread. Lol, cya diet. Let’s be real, summer doesn’t cease in Queensland. 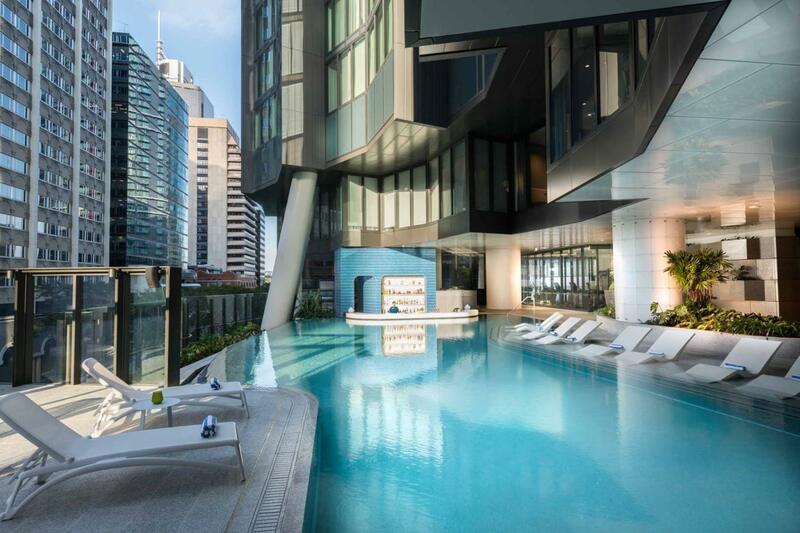 The Westin is taking advantage of an Endless Summer at Brisbane’s only swim-up pool bar, Nautilus, with balmy arvo cocktail sessions. Every Friday, Saturday, and Sunday, you can receive access to Nautilus Pool Bar (generally only available to hotel guests) and one spritz cocktail, glass of boutique wine or craft beer for an easy $20 (tickets available here). You’ll find us knee deep in both the pool and piña coladas. If you’re fishing for more than Instagram likes, Caxton Seafood Festival is the place to be. Crack into the Cacko on Sunday, May 5 from 10am for five live music acts with the festival spread out through the carpark beer garden. Expect ping pong tables, giant Connect 4, two pop-up bars, an oyster eating comp, and plenty of seafood-fuelled food trucks and platters from the Caxton’s restaurant. Entry is free, so make sure you go!